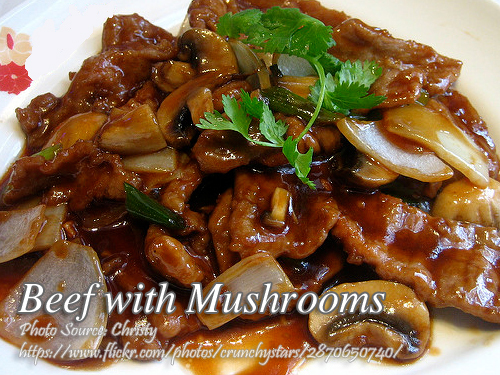 Another mushroom dish is this beef with mushrooms. Like the other mushroom dish I’ve posted here, you can use varieties of mushrooms like button mushrooms, Shiitake mushrooms, straw mushrooms or oyster mushrooms. This dish is easy to prepare and cook so if you can’t think of any new recipe I’m sure you will like the taste of this dish. To cook this dish, cut beef into 1/2 inch cubes. Dredge with flour and heat oil in a skillet and fry beef until brown. Lower heat and add remaining ingredients except mushrooms. Cover and bring to a boil. Simmer until beef is tender. Season with salt and pepper to taste and add mushrooms during the last five minutes of cooking time. Cut beef into ½ inch cubes. Dredge with flour and heat oil in a skillet and fry beef until brown. Lower heat and add remaining ingredients except mushrooms. Cover and bring to a boil. Simmer until beef is tender. Season with salt and pepper to taste and add mushrooms during the last five minutes of cooking time. Serve hot. Good for 6 to 8 servings. I like your creativity. Thank you for sharing your recipes.